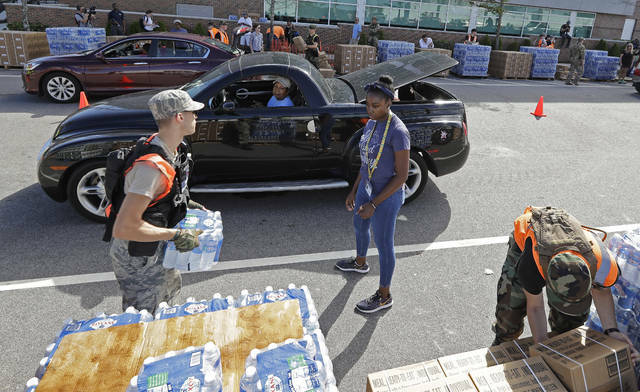 WILMINGTON, N.C. (AP) — Hundreds of people waited in long lines for water and other essentials Tuesday in Wilmington, still mostly cut off by high water days after Hurricane Florence unleashed epic floods, and North Carolina’s governor pleaded with more than 10,000 evacuees around the state not to return home yet. The death toll rose to at least 35 in three states, with 27 fatalities in North Carolina, as Florence’s remnants went in two directions: Water flowed downstream toward the Carolina coast, and storms moved through the Northeast, where flash floods hit New Hampshire and New York state . North Carolina Gov. Roy Cooper warned that the flooding set off by as much as 3 feet of rain from Florence is far from over and will get worse in places. Addressing roughly 10,000 people who remain in shelters and “countless more” staying elsewhere, Cooper urged residents to stay put for now, particularly those from the hardest-hit coastal counties that include Wilmington, near where Florence blew ashore on Friday. “I know it was hard to leave home, and it is even harder to wait and wonder whether you even have a home to go back to,” Cooper said. In Wilmington, population 120,000, workers began handing out supplies using a system that resembled a giant fast-food drive-thru: Drivers pulled up to a line of pallets, placed an order and left without having to get out. A woman blew a whistle each time drivers were supposed to pull forward. Todd Tremain needed tarps to cover up spots where Florence’s winds ripped shingles off his roof. “The roof is leaking, messing up the inside of the house,” he said. Others got a case of bottled water or military MREs, or field rations. An olive-drab military forklift moved around huge pallets loaded with supplies. Nearby, about 200 people lined up to buy 40-pound bags of ice as quickly as a Rose Ice and Coal Co. could produce it. Supplies have been brought into the city by big military trucks and helicopters, which also have been used to pluck hundreds of desperate people from atop homes and other structures. 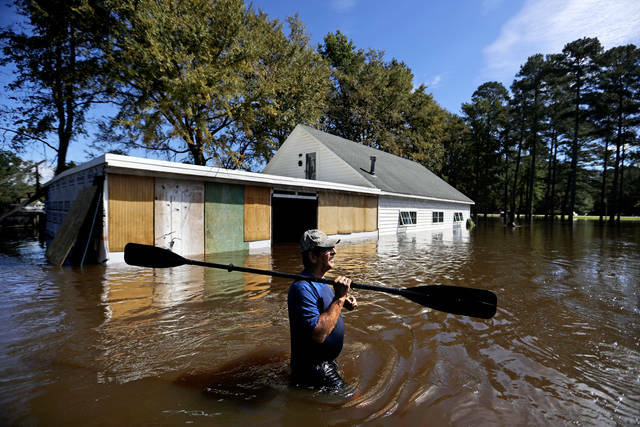 At Fayetteville, about 100 miles (161 kilometers) inland, near the Army’s sprawling Fort Bragg, the Cape Fear River had risen about 50 feet (15 meters) toward a crest that was predicted to be more than 25 feet above flood level. On Tuesday, logs and other debris became trapped under a rail bridge as rushing brown water pushed against the span. The river swallowed trees, lamp posts and a parking lot near its banks. City officials warned that still-rising water threatened some neighborhoods and businesses that seemed safe, but said the worst was nearly over and life was beginning to return to normal downtown. Businesses were re-opening and owners were removing sandbags and plywood from storefronts. Human and animal waste is mixing with the swirling floodwaters, which have killed about 1.7 million chickens on poultry farms. 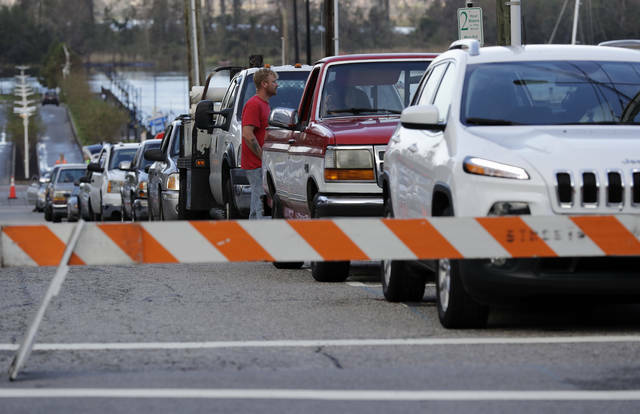 More than 5 million gallons of partially treated sewage spilled into the Cape Fear River after power went out at a treatment plant, officials said, and the earthen dam of a pond holding hog waste was breached, spilling its contents. A dozen more such pits, which contain animal feces and urine, were damaged. In a bright spot, the Lumber River appeared to be falling in hard-hit Lumberton, about 70 miles (113 kilometers) inland. Power outages in the Southeast also were down, from a high of more than 910,000 to about 310,000, nearly all in North Carolina. The dead include a 1-year-old boy who was swept away after his mother drove into floodwaters and lost her grip on him. Authorities in Virginia said a man was killed Tuesday when his pickup truck was caught in a flash flood.